What contentment to report on such varying cultural activities as the visits of James Edward Olmos and Rigoberto Gonzalez in Kansas City, the presentations of Noche de Colibríes: Ekphrastic Poems in Chicago and Wisconsin, in addition to another in Brazil, and Con Tinta’s celebration of National Poetry Month. James Edward Olmos in Kansas City brought excitement, energy and friendship. What a pleasure it was to see him in person, to hear him talk and see him perform his presentation. There is no doubt of his great commitment to the Latin@/Chican@ community. His presentation was on Tuesday, April 15 at the University of Missouri-Kansas City (UMKC) to celebrate Cesar Chavez. Muchas gracias a Erika Cecilia Noguera, Coordinator of the Division of Diversity and Inclusion at UMKC, for her dedicated work and for making the Cesar Chavez Lecture possible. After his UMKC presentation, James Edward Olmos continued his conversation with the Kansas City community at the Guadalupe Centers, where a reception in his honor was held. Another distinguished Chicano writer visiting Kansas City was Rigoberto Gonzalez, American Book Award recipient, on Tuesday, April 8 from 5-8 p.m. at the Student Union at UMKC. His visit was part of Literature for Life Week. Rigoberto Gonzalez’s reading was followed by a Q & A and book signing. Several members of the Latino Writers Collective, Kansas City, attended this important event. Many thanks to my wonderful hosts in Chicago and Appleton, WI for making the presentation of Noche de Colibríes: Ekphrastic Poems possible. Miguel López Lemus and Kapra Fleming opened the doors of their home to receive the literary and artistic Chicago community on March 27 for an Art Salon. Thank you Chicago for your warm reception and endless support. Appleton, WI was next on Saturday, March 29. Several members of the Latino Community graciously attended the Art Salon for the presentation of Noches de Colibríes: Ekphrastic Poems hosted by Yasser Bashi and Reme Bashi in their amazing home. I have no words to thank their affable hospitality. Among the people who attended the Art Salon was Paco, who I’m happy to say has been present during all my visits to Milwaukee and Appleton, WI. I first met Paco in March of 2012 during a Poetry Workshop in Spanish I gave at Woodland Pattern Book Center. He then attended my presentation as part of Cantos Latinos in Milwaukee organized by Brenda Cárdenas. I’m proud to say that I’ve been following Paco’s development as a poet and will continue supporting him. 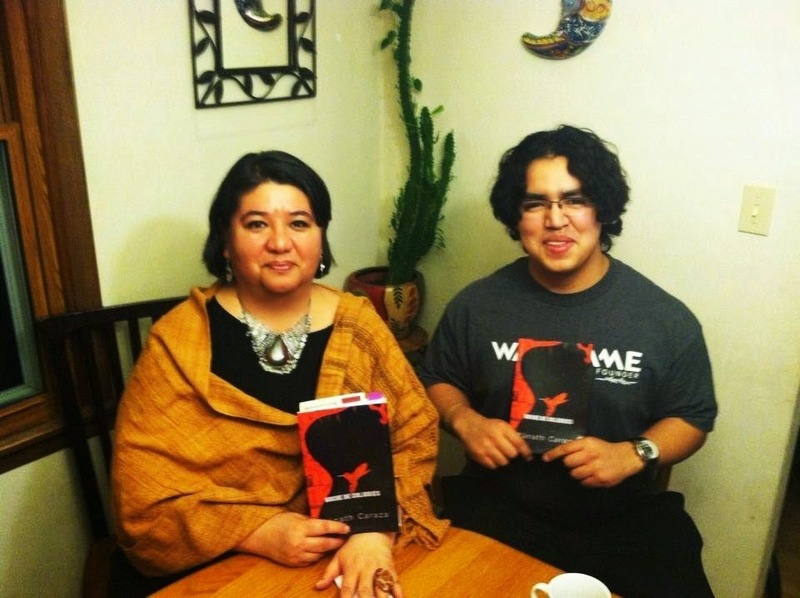 Paco is an avid reader and poet, now a young man, who has graciously read all of my books. So proud of you Paco. I had the unique opportunity to be part of the 7th MECA (Muestra de Educación Ciencia y Arte) in Apucarana, Paraná, Brazil. I had a couple of presentations, roundtable participation, book presentation, and classroom visits. My main presentation was on Estructura de enseñanza básica en México: formación, práctica y carrera docente, y poesía. Another highlight of my visit was the opportunity to meet the award winning novelist, Oscar Nakasato, from Apucarana. I was able to exchange a few words with him and exchange books. He is the author of Nihon Jin (Benvirá, 2011) winner of the Premio Benvirá de Literatura. Iguaçu Falls was the last part of my intense trip to Brazil. I’ll let the photos speak for themselves. Dr. Barbosa and Dr. De Jesus many thanks for all your support and great organization. CON TINTA NaPoMo 2014 is here, send your poem to creativexc@gmail.com and/or mouthfeelpress@yahoo.com (Mouthfeel Press) y celebra la poesía. This is Con Tinta's third year celebrating NaPoMo, more to come. Viva la poesía! Yo enloquezco, me derrito como nieve en el calor. que me traigan un doctor. Que quiero una casa grande con jardín. A quien el tiempo no dio tregua. Para que pasen madurez en el infierno. En esos días de sol y nieve y poesía. y los regurgitan en los picos de sus polluelos. para que nadie mire mis incontenibles temblores. (tal vez una carcajada o una foto obscena). ya sacuden sus alas de cristal incontables relojes. A most beautiful posting with such gorgeous pictures. Gracias, Xanath! Saludos! Have a wonderful day!